The Meadow Green Restaurant has a fresh, crisp yet elegant interior, which is perfectly accompanied by delectable meals and service of the highest standard. The A La Carte menu at Meadow Green consists of a carefully planned selection of specialty dishes, ensuring only the best quality and freshest ingredients are served at all times. The buffet breakfast time has made Irene famous for being the number one destination for lazy leisurely mornings, with everything on offer from home-baked pastries to fresh fruit. 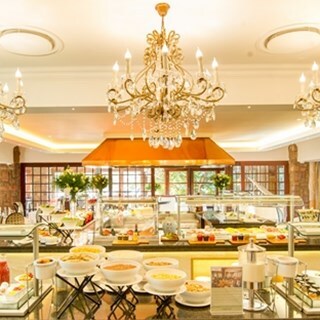 Sunday lunches are a special treat with a buffet and carvery in true South African style. Food was great however service wasn't but Khensani, Asst. Front Office Manager intervened to compensate the bad service. Wonderful ambience and the view is heavenly! The kids had great fun with the Easter Egg hunt! All was well until our waiter poured hot milk all over me. He apologised but i think it would have gone a long way for management to acknowledge the horrific accident and apologise to me. I was impressed the first time we booked this venue but I am far from it now. It was my sister's 72nd birthday and I was treating the family (who have gone through such trauma over the past 3 years), that they enjoyed the experience and of course the scrumptious food so much. As usual, all your employees were absolutely awesome. They all went out of the way from Reception, Guest Relations and your restaurant to make this such a memorable occasion. Thank you so very much. We will be back - possibly for my brother-in-law's 75th and my 70th later in the year. We loved the live music and the romantic atmosphere. It was truly special. I had booked for buffet lunch for Saturday, so to ensure that I had enough budget I called again on Friday just to inquire about prices, etc. Only then I learned that there was no buffet on Saturday. Imagine the disappointment we could have come to. Other than that there is no issues at all. I was disappointed to find that your buffet was not on offer that day. your buffet is exceptionally delicious and I always look forward to coming and dining there. I was rather also disappointed with your A la carte menu. I would highly recommend that you add more dishes as the variety was rather limiting for me. but overall the experience was great thanks to your most hospitable staff. I look forward to coming there for another buffet this time around. We had a lovely time at the restaurant. Their food was amazing (with so many options) and the service and view was perfect as always. 1. Your wine prices are very expensive if compared to other Restaurants. Why would you charge almost four times more for a bottle of Pierre Jourdan compared to retail stores? Consumers will rather then have a beer compared to wine at that price. You are losing out on business and spend per head. 2. The service for drinks and cleaning the tables were really slow. 3. Our table was set but with no serviettes. We had to ask the waiter for it after having our first dish. 4. We paid for Buffet but then you ran out of Pork Belly. Not all my guests got. I complained about it but there was no plan to be made. 5. i indicated that it was a special 70th birthday and i was promised something special for the occasion. Nothing materialized. 6. I was really a disappointing experience! if you dont improve the quality of product and service you will lose business! Consumers expect more at those prices. your service and delivery doesn't match your new premises!!! Very disappointing. The experience was fantastic the room the message  ,the food as well as the service from friendly helpful staff . Beautiful environment. Very serene and a great atmosphere. I hope to go back soon with my family. The staff is very hospitable and the food was delicious. The service was absolutely outstanding! The waiters were always present and ready to assist. The place was beautiful and extremely clean. Wonderful experience with family for a special occasion. Food was good, service excellent and the ambiance lovely. We higly recommend Meadow Green Restaurant! First I want to say that it was an amazing experience, the massage for myself and my girlfriend was great. A bit short because we had to wait for the staff had not prepared the locker, and it was given to someone else. The room was amazing, but what really brought this experience down was the way the waiter treated us, when he found out that we staying over the weekend and every thing was paid for. We got to the restaurant just after 6pm, we were seated at a place that we choose. After a few minutes a male old waiter came to our table and ever so friendly. After we told him that we staying over and that there is also a bottle of wine that’s included in the package, his attitude change completely. Being rude and telling us that there is only dry red wine that we can choose from. Myself and my girlfriend thought of even standing up and leaving, but we were tired and hungry. After waiting at least 5min, I asked another waiter to call our waiter. He got there with an attitude and started to pour the wine. After the first sip of the wine we decided to get some coke to wash it down. I called the waiter and asked him to please bring us some coke. With an attitude again he told me that any other drinks have to be paid separately from the meal. Again keeping my cool I told him that it was ok and we would do so. Then he added to say that we must pay by card and not cash. So we got up and went to dish up the food. I know that there is cows in the area but there were flies everywhere even in a jar with oil there was ca dead fly. The flies were all over the food. I even addressed this issue to the person that was dishing up. She went to get a piece of cardboard to chase the flies away, not that really helped. We dished up and this took us at least 10min plus. We got to our table and the waiter had not even brought the coke yet. We saw him helping other clients and bringing them there drinks. I called him and asked him where the cooldrink was, he said he will bring it, and he did after a few minutes. I can not believe for an amazing place like this to be treated the way we did and to have flies all over the food. I expect someone to answer to me or even call me on this happening and what’s the way forward. We felt like scum and the way we were treated and for the flies all over the food I have no words for this. If you want to know the waiters name, you can try and go back on Saturday who paid for 2 small cans of coke for R64,00. I know that waiters live on tips but that is the worst service I have ever received and get better service at a Wimpy, not cool at all. Good experience. The restaurant has a great atmosphere. Sadly the quality of the food at the buffet has gone down. service from booking to the day at restaurant.. I was really impressed. The croissant was probably the best I've ever had, locally or abroad. There was a white gentleman that continued to walk to our area for no apparent reason with a very impatient look. We were not informed about the cashless environment and I was not told my guests had to be inconvenienced because of this. We were given a price of 230 for the buffet which was billed 275 in the end, and we were asked as to when we leaving because of an apparent booking taking place which in being in the field I’m well aware that you NEVER say that to paying customers unless you specified beforehand. We overpaid for a buffet and inconveniences set by the miscommunication and lack of consistency by your company. As a long term client I’m highly disappointed and aggravated by such tediousness, it’s unacceptable. The food was amazing service was just as good.